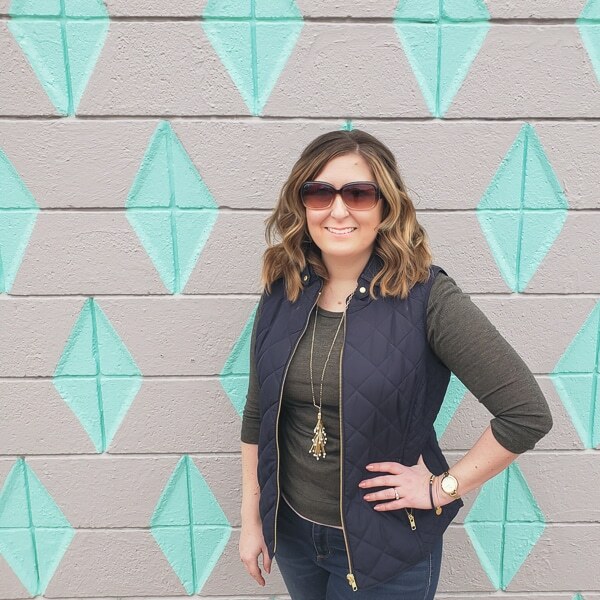 As much as I love a HUGE organizational makeover, sometimes all we need is a little tweak to make day to day life a bit easier. 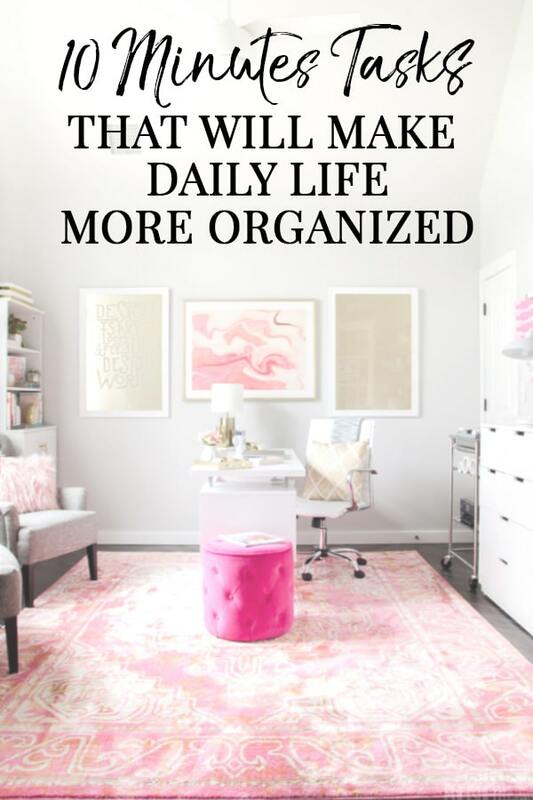 And making life EASIER is what organizing is all about. 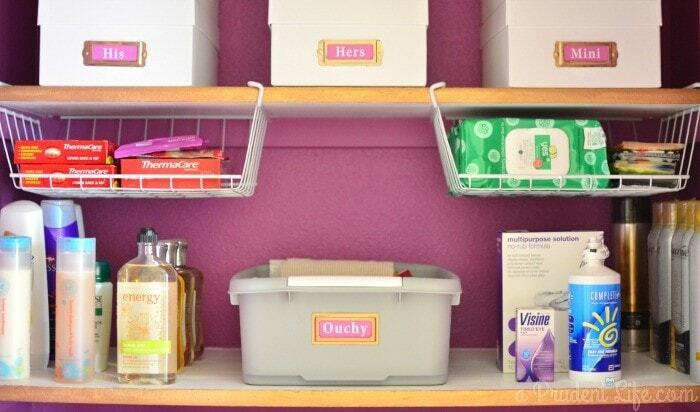 Next time you’ve got ten minutes, try implementing one of these quick organizing ideas for your home. 1. Pool/Beach Bag -I started this when we had a gym membership that included a pool. Year round, we have a bag hanging in the coat closet that is ready to grab for swimming. 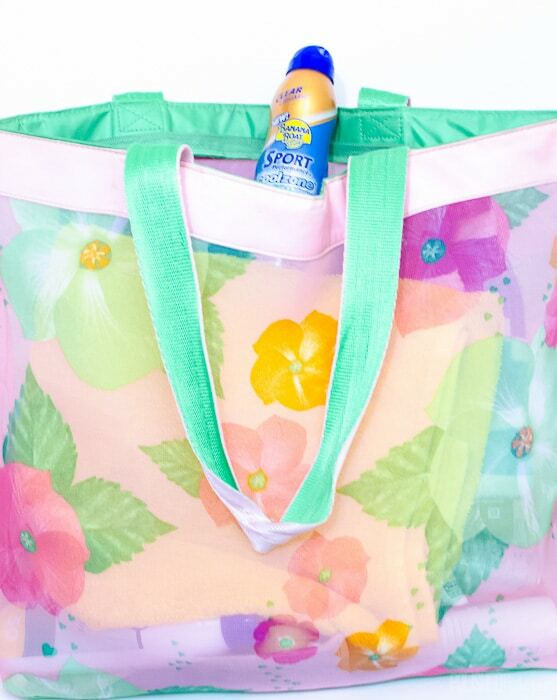 It holds things like sunscreen, lotion, bug spray, beach towels, goggles, and even a couple magazines. The towels get washed and put right back in the bag. It’s so much better than running around trying to gather things up at the last minute. I love that the bag is colorful, but still see-thru to make finding things easier. Here’s a similar option on Amazon. 2. Sport Fan Bag – The other bag that’s always ready is a nylon/washable drawstring backpack I take to football and basketball games instead of my purse. Because it never fails that someone behind us will spill a sticky drink and it will flow toward my purse like a moth toward the light. In the bag, I keep things like chapstick, hand-warmers, gloves, and some Advil. I also have band-aids, which is funny since we’re not the ones getting knocked around the field, but preparedness is a good thing, right? On game day, I just throw my wallet and phone and we’re ready to go. Repeating reminders on your phone or computer can be game changers! Take your 10 minutes to add the following events so you never forget them again. 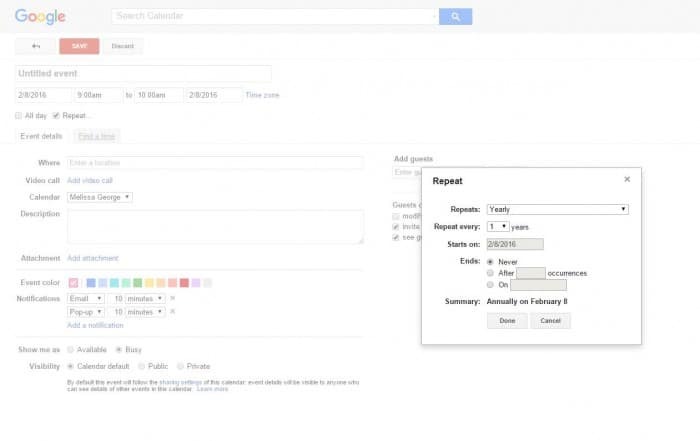 I use Google Calendar, but iCal works too! 3. Birthdays – Add all your family/important friend birthdays and set them up to repeat annually. If you wanted to go really nuts, you could even add a 2nd reminder a week ahead of time to allow for shopping and/or shipping time. 4. Home Maintenance – Ever forget to change your home’s air filters? Set up a repeating reminder! You can even add your filter sizes to the notes section so you can pull it up at the store! *My Husband gets full credit for this idea and implementation. 5. Travel Toiletries – Do you have little product samples floating around all your bathroom drawers/cabinets? Do a quick pass through everything and gather all the sample/trial sized items into one spot. A cheap photo box works well. 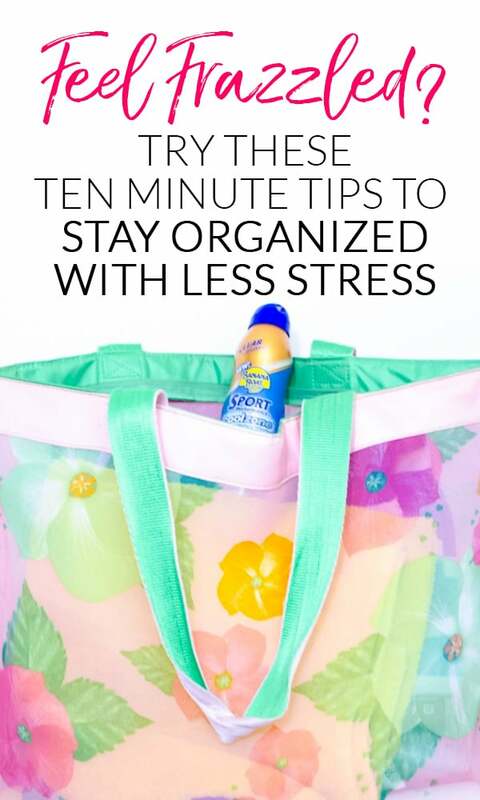 Next time you pack, you’ll save time and stress. 6. Nail Care – For some reason, we could never keep track of nail files or clippers. 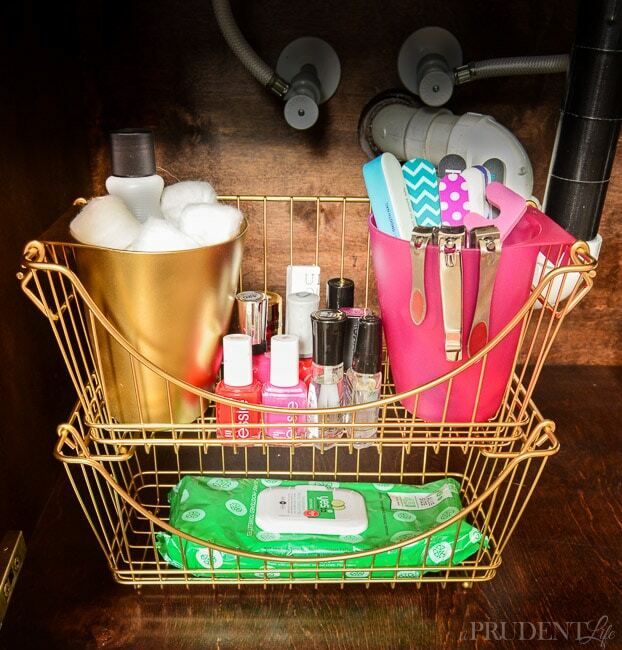 Years of frustration were fixed in minutes when I added a basket just for nail care under the bathroom sink. I divided the stackable basket into three sections using old IKEA containers. Clippers now hang on the top and no longer go MIA because everyone knows exactly where they go when we are done with them. 7. Donation/Sale Box – Have you ever tried something on, decided you didn’t love it, and then hung it right back up in the closet? I think most of us have a tendency to want to purge all in one swoop. 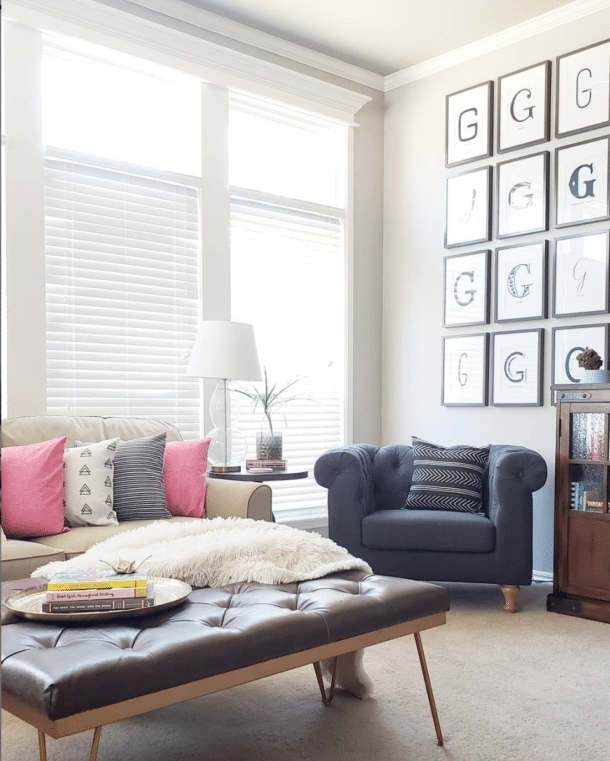 Instead, take 2 minutes to designate a spot in the house to hold things you no longer need. You’ll fill it up over time and will be ready next time a pickup service calls to ask if you have any donations to put out. 8. 10 Minute Attack -Think about the room, closet, or cabinet that is making you crazy. Maybe it’s the kitchen cabinet that things literally fall out of when you open the door. Set a timer for 10 minutes and purge. Grab anything that doesn’t belong or that you haven’t used in a year and fill up that donation box. You aren’t going for perfection, you are going for improvement, and you won’t believe what I difference 10 minutes of concentrated effort can make. 9. Pencil Cup – If you’ve ever found yourself searching the house for a Sharpie or highlighter, you’ll love this. Instead of having one big pencil cup on your desk, switch to a divided rotating option. You can use one section for pens, one for pencils, one for highlighters and sharpies, and the fourth for scissors and frequently used Post-It notes. 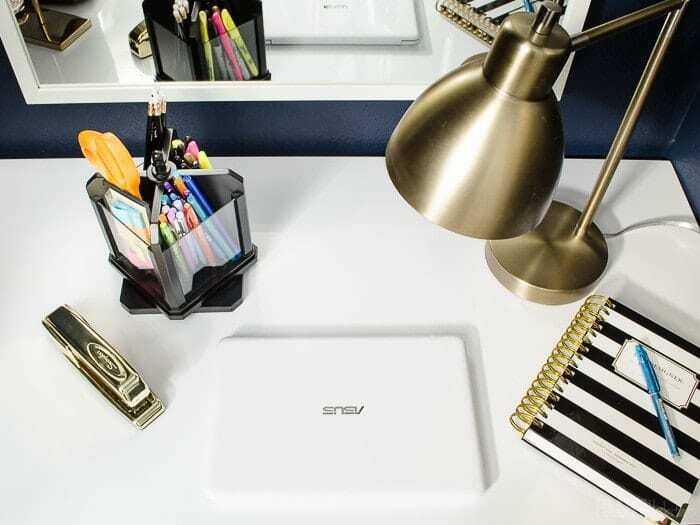 It’s a tiny change, but really does make day-to-day office tasks less stressful because it’s easy to grab exactly what you need without digging. I couldn’t find my exact option online, but I found a few others in a fun variety of styles like black metal, and chic acrylic. 10. Cookie Cutters – I used to have a giant mess of cookie cutters covering all the major holidays and more. I had tried to at least separate them into gallon sized Ziploc bags, but it was still an ordeal when I needed to find the right ones. Not to mention they were taking up valuable space in a cabinet when I really use them 2-3 times a year. In 10 minutes, I solved years of frustration by dividing the cookie cutters into inexpensive labeled photo boxes for each holiday, plus one for sprinkles! Now they can be stacked on a top shelf out of the way AND it’s easier to find what I need. Win-win! Speaking of photo boxes, I’ve got a whole post of quick ideas just for them. They’re inexpensive (~$2 each! ), cute, AND functional for so many areas around the house. 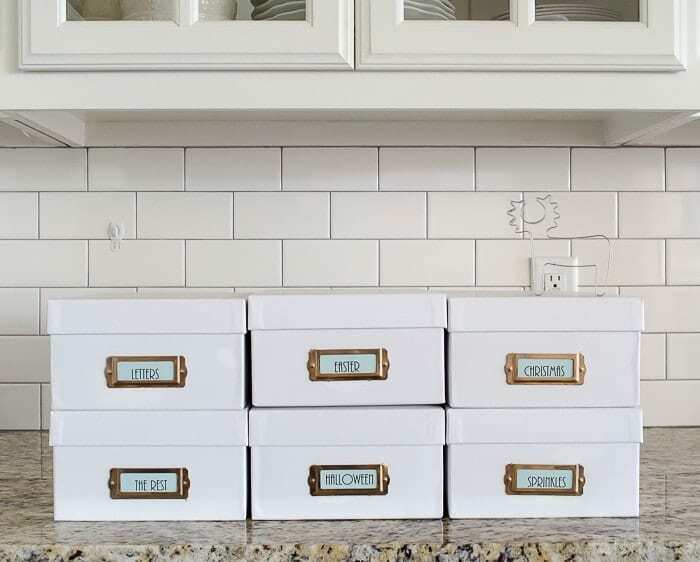 Head to see 11 Ways to Organize with Photo Boxes next! Awesome post Melissa! I’m an organization freak but you’ve given me a couple of new ideas to add to my rotation. Well done you! Success! So glad I came up with some new ideas for a fellow compulsive organizer! I always love seeing how Melissa makes it look so effortless. Where did you find that adorable pink office rug? Ah thanks, Patty! Here’s a link to the rug from Wayfair: http://rstyle.me/n/csuwczb5wxf (that’s a referral link so if you happen to purchase, you pay the same price and I get a small commission – no pressure though!). It looks a bit darker in their photos than it does in real life. I think I’ll make some quick X-wing dividers for my pencil cups. Never thought of them. Thanks! And I just realized I have too many containers for stuff like this in a collection of pottery cups on my lazy susan on the b’fast table. Occasionally someone tumps one or more of them over resulting in a declutter and reorganization. Yes, we do sort coupons and such there, and write grocery lists, and work crosswords and other puzzles…. But there’s a desk a few feet away, and the items on the lazy susan, along with one of stevia packets, are more bother than they’re worth — and more an accumulation of not returning office supplies to their homes than a result of true need or efficiency. I’m racking my brain to think of anything other than stevia, napkins, and salt/pepper grinders that actually belong on the table. Oh yes! I’ve been looking for a new home for mustards (of which we have quite a selection) and amino acids. They should belong on that lazy susan, not office supplies! Whittling down to one sharpie, a couple of pens, one pair of scissors, and a notepad; maybe a few gem clips — all in a divided container to keep them organized, maybe attached to the side of the nook’s bench, not on the lazy susan. I’m going to sort based on true need, as I’ve done at other mini-stations, and organize a different holder for all. Thanks for making me aware of the ongoing annoyance! It’s it fascinating how many things subtly annoy us on a daily basis that we just work through instead of improving. I’m 100% guilty of it too. And every one I fix makes me a little more patient with the other things (and people!) that are outside of my control. I love these ideas. My favorite is the cookie cutter storage. You’re a genius!! Where did you find the white photo boxes? I’d love to use white photo boxes, to match my kitchen. Thank you so much for sharing so many great ideas. Hi Kim, They came from Michaels as well! They don’t usually have the white ones in the big aisle displays of the photo boxes, but they’re always the same sale price and are usually on an aisle around the scrapbooking organization. Sometimes they’re WAY up on a high shelf and you have to find someone to get them down. Totally worth it though! I’m a hoarder but a neat one. If my son’s ever need to clear out our home, it will be easy. Everything is marked. Every time I get rid of stuff, then I found an idea to use the things. I’m 72 on June 18th so think not much time to do all I would like to. You have given me lots of ideas for photo boxes. Thank you. I’m totally in the same neat hoarder category! I do like purging things out of the house when I KNOW I’m done with them, but there are other things I hang onto knowing that either I’ll find another use OR I’ll run into someone that needs the item. We kept our old small dining room set in the attic for 6 years and all the sudden a friend was helping a sweet, young family who was struggling financially. I told her to ask them what their biggest wish would be and it was a dining table and chairs so they could have meals together. Our table was adjustable from a 2 person to 4 person table and completely perfect for their small space. All that to say that sometimes there is a reason for hanging onto things, but that you’re also being a HUGE blessing to your sons by keeping everything organized! But, I hope they don’t have to deal with your organization for many, many years to come! @Donna Jean, this has been on my mind lately. I have cleaned out both parents’ homes when they died — one was huge with the clutter of years and years; the other by that point only a one bedroom apartment. The amount of “stuff” — even useful household “stuff” in a one bedroom apartment — is just amazing and overwhelming. And I tell you, it would not have been easy to find homes and designate and disburse everything, even if it were organized and labeled. (And there were four of us working.) I am NOT so organized or decluttered, and I do not know if I ever will get there at the rate I’m going! 🙁 I’ve been thinking it will be a real burden on our one offspring. Does anyone have a “house contents inventory” in a notebook? Some type of list? I’ve been thinking of even going ahead and designating a beneficiary for items ahead of time. Oh, and making a list of items that may be valuable versus stuff that could just be sent away. And a description of the things that might be meaningful to someone in the family. I doubt seriously my son will want many of the belongings we know are valuable, but it’s a big puzzle for anyone from another generation to figure out after someone’s gone. And that’s not including the house itself! Doing an inventory of the valuable items would be VERY helpful to all! And just decluttering things that aren’t sentimental or useful a little at a time is great too. It’s not a process that anyone younger should overlook either. If anything happened to us, our families would have a hard time and there are spaces I know I need to clean out. Or tag a friend to help. I promised a friend of anything happened her, I’d fly in and handle her disaster of a cluttered craft room so her husband didn’t have to!